First New York, Now London? I have such a great life. My husband has not only become a fabulous bartender, but he also loves to bake bread. And lately he's become enamored of the various no-knead and 24-hour recipes that are making the rounds. A couple of days ago he started some dough, then yesterday he popped it into the oven. Since I'm a great believer that a good homemade loaf goes best with a big pot of homemade soup, I took the opportunity to use some of the Borlotto Lamon beans I'd bought from my friends Anthony and Carol Boutard of Ayers Creek Farm. The history of the Barlotto Lamon bean begins on the Lamon and Sovramonte plains of the Veneto region of Italy where they are planted on the third of May, Santa Cruz day, which is dedicated to masons and builders. These brown-spotted pink legumes have been grown on the Lamon plain for about 500 years and, according to Practically Edible, "a man named Pietro Valeriano (aka Giovan Pietro Dalle Fosse) was an official for Pope Clemente VII. Reputedly, the Pope gave him a bag of beans from Spain and he brought the beans to the area in 1532. The beans were popular, and replaced the growing of peas and broad beans." It goes on to say that "the production of Lamon Beans has been controlled by the 'Consorzio per la tutela del fagiolo di Lamon della Vallata Bellunese' since 1993. In 1996, they obtained European PGI protection" and that "when sold fresh, Lamon Beans are called 'badana' in the local dialect." All I can say is that when combined with chicken stock, kale and a little salt and pepper, these babies make a satisfying soup to sop up with some of Dave's bread. In large soup pot, sauté bacon till fat is rendered but not crisp. Add olive oil, onions and garlic and sauté till onion becomes transparent. Add stock and beans, bring to a boil, then simmer for 1 1/2 hrs. or until beans are tender. Add chopped kale and bring to boil, simmering another 20 min. Add salt and pepper to taste. 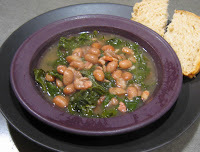 * This recipe will work with any number of dried beans such as cannelini, flageolet, navy, etc. Nice! There's nothing like a good bean soup on a chilly night, and this one's so adaptable. Love it!